Liver pâté is a big part of the Danish Christmas celebration, especially for the christmas lunches. Most workplaces throw a Julefrokost, aka christmas lunch. It might not be during normal lunch hour, but more likely a big party at night including food and a lot of beer and snaps. I've been to large events, with stand-up comedians and live music. At a traditional julefrokost/christmas lunch one of the dishes will most likely be warm liver pâté with crispy bacon and sautéed mushrooms. I gave my other liver pâté recipe a makeover. I wanted a smoother texture and I wanted to eliminate the pork fat. I really like how this turned out. This one will definitely be my go-to recipe. It's simpler to make and the favor is spot on. Makes 5-6 small or 3 big loafs. Using a meat grinder at the finest setting, pass the liver, bacon onions and mushrooms through the meat grinder twice. Melt the butter over medium heat in a saucepan. When melted take off the heat. Add the cream to cool it down. Mix all the ingredients together. Pour mixture into 5-6 small aluminum baking pans and top each with a small piece of bacon. (I wasn’t able to find the small pans, so I used a bigger size, and ended up with 3 pates. Bake the liver pâtés in a water bath at 360℉ (180℃) for about an hour. I preheat the oven, and place a slightly larger baking pan in the oven. Place the liver pâté on the baking pan and add some boiling water to the pan. Let the liver pâté cool somewhat before eating. But warm liver pâté taste really good served hot with bacon and sautéed mushrooms. You can freeze the uncooked pâtés and bake them, when needed. Curry Salad for the pickled herrings. Pickled beets for the liver pâté and frikadeller. I have had liver pâté all my life, well after I started eating solid foods. I love this stuff. If you are danish, you'll have an open faced sandwich with liver pate in your lunch box from kindergarden and up. Because we are raised on open faced sandwiches with liver pâté. We will eat it for lunch with sliced cucumber or pickled beets on a weekday, but it's also served at holidays with crispy bacon and sautéed mushrooms. 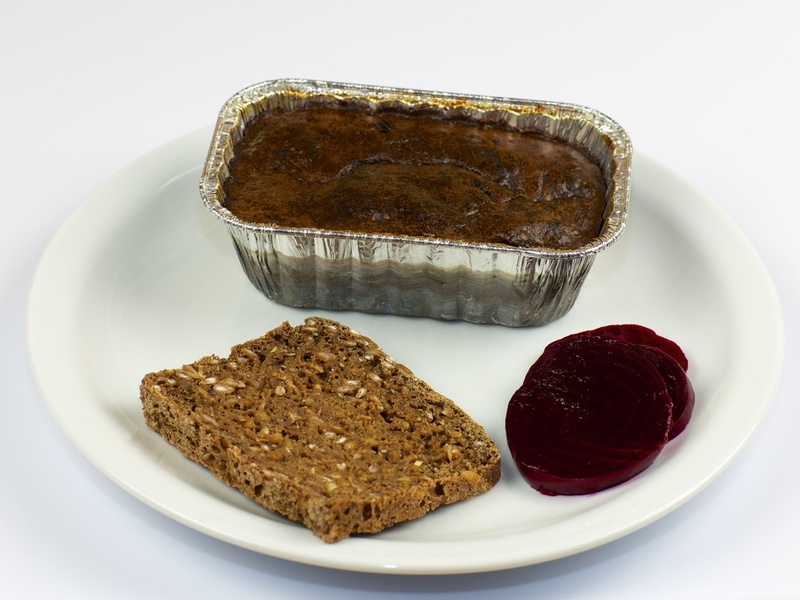 The liver pâté came to Denmark in 1833-1847, and was sold to the very wealthy. It became more common after the bacon export surged and the excess of pigs liver grew, making the liver pâté affordable for most people. My mom made her own liver pâté, but she didn't grind the liver herself, she bought a frozen liver mixture and added onion, eggs, milk and spices. Much easier but it's not an option here in the US, to my knowledge at least. Danish people are like al others, most of us doesn't like to eat liver. But even people who hates liver, can love liver pâté - it's a whole different thing. Making liver pâté is not a pretty process. The liver mixture looks kinda gross. Grinding the liver is a messy process. But It's worth the effort in the end. I always make a big batch, and freeze the unbaked pâté in small loaf pans. That way you can have a fresh baked pate for lunch or dinner within an hour. Makes 5 small liver pâtés. Pass the fat and then the liver through a meat grinder at the finest setting, and mix it together. Now pass the mixture through the meat grinder again alternating with the onions. Add the rest of the ingredients and mix it well. Pour the mixture in small aluminum loaf pans. Bake the liver pâté in water bath at 360°F (180°C) for about an hour.